In this year's 2018 legislative session, HB 7087 was passed that added Section 10 to Florida Statute 212.055 governing local tax referendums. A Performance Audit is now required and must be completed and published online 60 days prior to the election for any local sales tax hike referendum held on or after March 23, 2018. The Performance Audit language added provides criteria for what the audit will examine and evaluate. 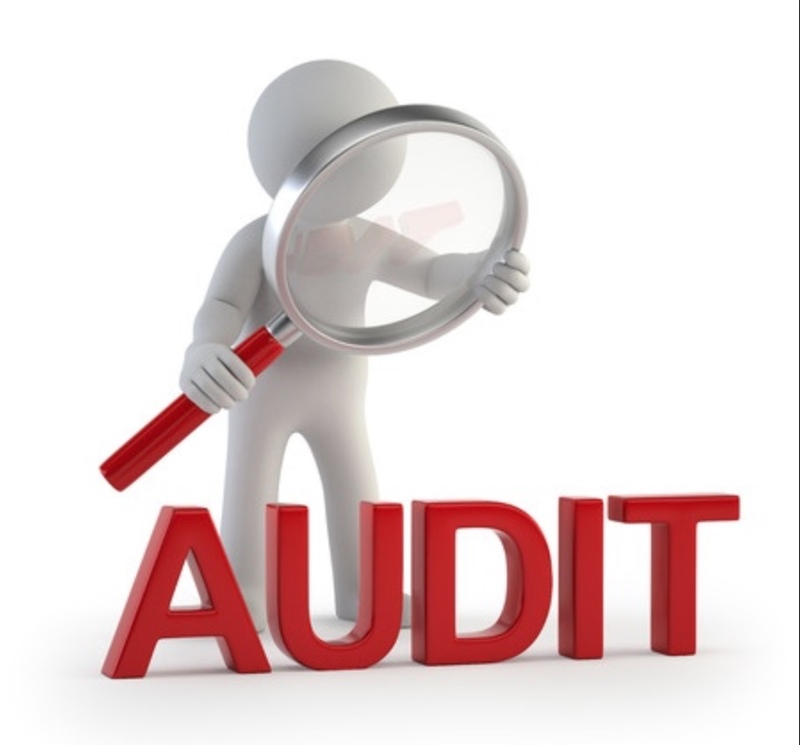 The audit must examine and evaluate how economically efficient or effective the proposed tax hike program is, the tax hike programs goals and objectives, alternative methods of providing the program, performance measures to measure programs success and is there adequate and accurate public documentation relating to the program. Money that the Hillsborough County School District needs to build schools and replace air conditioners might be farther from reach, thanks to a new state law and a bureaucratic process required before the voters can decide on a tax referendum. The law could delay a sales tax referendum by about eight months, past the November election that would usher in the needed bonanza. An April 16 letter from the Legislature’s Office of Program Policy Analysis and Government Accountability said districts had to submit their resolutions by April 23 to arrange a required performance audit by the legislative office, known as OPPAGA. OPPAGA contacted all counties and school boards in the State. OPPAGA's April 16 letter, addressed to the Chairs of each county commission and school board (copy also found here), stated to contact OPPAGA by April 23rd for any referendum on the August or November ballot and to contact them ASAP if a referendum was being considered. A citizens’ group called All For Transportation is gathering the required petition signatures to place a question on the November ballot about a penny sales tax to subsidize public transportation and needed road repairs in the cities and county. And, because the law requiring the OPPAGA audit specifies "county or school district" and the citizen group is neither of those two things, they do not believe they will have to take that step. We do know there's been some confusion regarding this new audit requirement, especially with a sales tax hike referendum initiated by a petition effort. However, from numerous sources we spoke to or contacted, all indications was that any local tax referendum regardless of how it got on the ballot, required the performance audit be completed and published at least 60 days prior to the election. For the November 2018 ballot, the performance audit must be completed and available to the voting public posted online by September 6, 2018. Something changed with the AFT PAC between June 14 and July 9. Perhaps they were advised by someone the performance audit does apply to any local tax hike referendum. And that would include AFT's proposed 14% transit sales tax hike referendum to raise Hillsborough County's sales tax rate to 8%, the highest in the state. Obtained via a Public Records Request, AFT emailed and snail mailed a letter to OPPAGA on July 9, 2018. On July 9, 2018 AFT informed OPPAGA of their citizen petition effort to put a transit sales tax hike referendum on the November ballot. AFT requested "that OPPAGA begin the process of arranging for an audit pursuant to the statute in sufficient time to comply with the 60 day pre-election deadline. We have seen no update reporting from the Times regarding AFT requesting the performance audit on July 9th. AFT has a very compressed timeline as their 6 week petition drive ends this week. All petitions to be validated must be submitted to the SOE by Friday, July 27, 2018 at 5pm. The SOE has 30 days to complete their validation process. 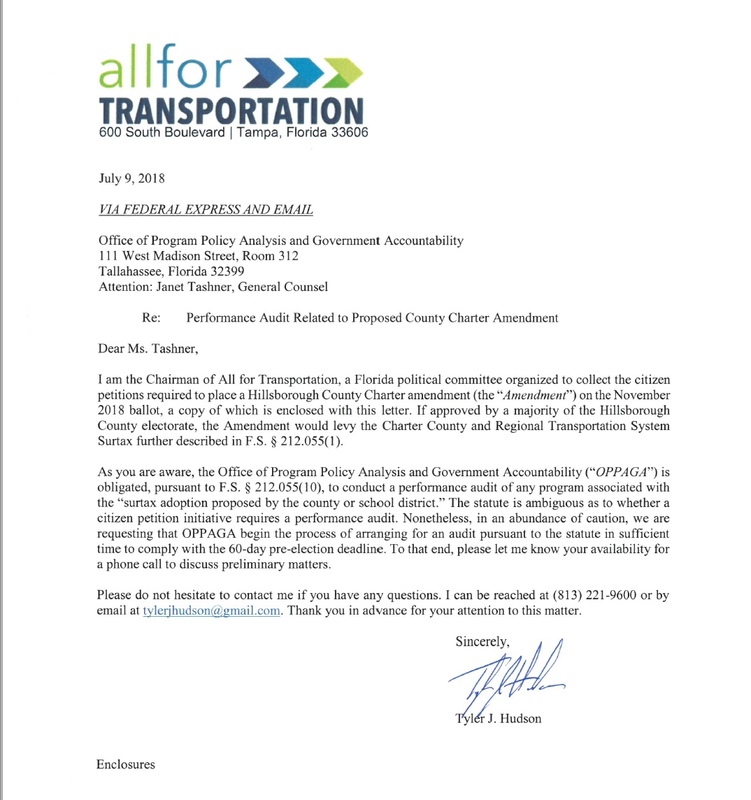 It is reasonable to assume the SOE will certify to the Hillsborough county commissioners, sometime between August 1st and the 30 day deadline of August 27th, whether the required number of valid petitions were submitted for the transit sales tax hike to be placed on the November ballot. Hillsborough County school board was told it may take 6 months to complete an audit for them. Is it possible OPPAGA can complete the required audit for this petition's proposed massive sales tax hike in 5 weeks or less? Does OPPAGA begin their performance audit process for any proposed local tax hike referendum being considered before it is officially placed on the ballot? Even if the audit process started July 9th when AFT officially notified OPPAGA of their petition drive, can OPPAGA complete the required performance audit in less than two months by September 6? Back in October 2015 during the Go Hillsborough debacle, the county had requested a sheriff's investigation of how Parsons Brinckerhoff (PB) received their no bid county contract to conduct that tax hike campaign. The commissioners also requested their internal auditor conduct an audit of the CCNCA procurement process used to award PB the contract. At the October 7 2015 BOCC meeting, the county's internal auditor Peggy Caskey, told the commissioners it would take 3-4 months to complete the audit of the CCNA procurement process and an additional 2 months to issue the audit report. That is a 6 month audit window auditing one county procurement process. This proposed transit sales tax hike is a $15-18 BILLION initiative that funds multiple programs in multiple organizational entities. The petition is not simple. It is 5 pages of legislative regulations and bureaucratic specificity that would be placed in the county's governance document - the County Charter for 30 years - if passed. Therefore, how complex or comprehensive will the performance audit be? Remember AFT decided to ram a normal 6 month citizen petition drive process into a 6 week petition drive. Their decision to use such a compressed timeline was theirs. They could have completed their petition drive last year or months ago. We doubt anyone can request OPPAGA somehow provide preferential treatment to complete their required audit to meet the September 6 pre-November election deadline. 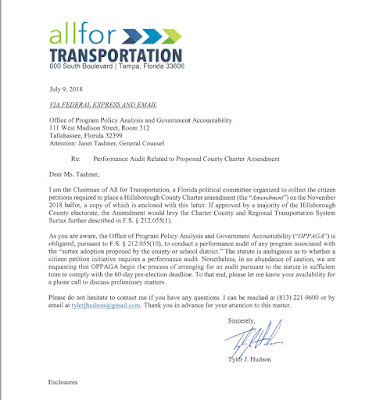 We know Hillsborough county must be audited for this proposed transit sales tax hike because it is a county levied tax. That is a good thing. We always wanted an independent audit done before there was ever another proposed countywide tax hike referendum placed on a ballot. Hillsborough County's property values are rising and growth is occurring so fast that one county commissioner said the county must re-estimate population growth on a yearly basis. We know Hillsborough County can fund its transportation needs within the county's existing ballooning budget: Fund Transportation and No Tax Hike Is Needed! AFT must first submit the required number of valid petitions by July 27th at 5pm. If they don't, the audit is a moot point because the tax hike will not be on the ballot. If they do, the completion of the performance audit by September 6 will become a critical path to actually getting AFT's massive 30 year 14% transit sales tax hike on the ballot. Sharon excellent post. The updated revenue numbers for the "NO Tax Increase Transportation Plan" are as follows: the plan would raise $8.486 billion over 25 years and to compare to that regressive sales tax attempting to be forced on the people of Hillsborough County it raises $12.7 Billion over 30 years, ALL WITHOUT RAISING TAXES. So the people of Hillsborough County, Tampa, Temple Terrance and Plant City have a choice if you can call what they are doing a choice. Give their money to Tampa to the tune of $15.2 billion or keep their money and still have all the improvements in roads , Transit and safety. Plus much more. The fact that the Media and Tampa Bay Times have shamefully and with malice purposefully withheld this information from the people of Hillsborough county speaks volumes as to which choice they think the people will make.